This is one of the revered pilgrimage sites of India tucked away in the mighty Himalayas. Open only for a few months during the year, Amarnath enshrines a natural Shivalingam of ice, and is reached after an arduous trek through the mountains of Kashmir. Amarnath is an ancient pilgrimage center. The Amarnath cave is located at a distance of 86 miles north east of Srinagar, at a height of 13000 feet above sea level. Shiva is worshipped here in the form of a Shivalinga shaped ice block, made by drops of water oozing naturally in the cave. To the left of the Shivalingam is another ice block representing Ganesha, and to the right of the Shivalingam are blocks representing Parvati and Bharirava. The cave faces south. 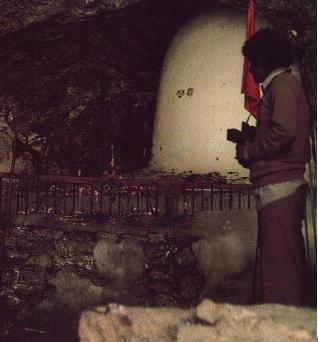 Inside the Amarnath cave is another small cave on the left of the image, from which a chalk like substance is given out to pilgrims as Vibhuti. Amarnath is surrounded by snow clad mountains. Legend has it that Shiva made the Gods immortal by providing them with the celestial nectar, and resided here upon their request. This boon of immortality lent the name Amarnath. Kashmir was a great Saivite center in the 1st millennium CE. Kashmiri Saivism is referred to as Trika Mata and it dates back to the eighth century CE. The three components of Kashmiri Saiva literature are Agama Sastra, Spanda Shastra and the Pratyabhijna Shastra. Kalhana, a contemporary of King Jayasimha of Kashmir of the 12th century describes Kashmir as Parvati incarnate. Legend has it that there was once a lake by name Sati-Saras named after Shiva's consort Sati. The demons residing here were destroyed by Sage Kashyapa, the grandson of Bhrama. It is believed that Kashyapa then converted this lake into Kashmira Mandala. Tradition has it that in every lunar month, the icy Shivalingam begins to form, on the first day of the bright half of the month, and reachest its fullest size on the full moon day, and then begins to wane and disappear on the new moon day. This process repeats itself each month. Since it is believed that Shiva manifested himself first on the full moon day in the month of Sravana (Leo), the only summer month that permits travel in this mountainous area, it is considered to be special to go on a pilgrimage to Amarnath during this month. The trek to Amarnath begins at Srinagar on the panchami day of the bright half of the month. The next halt enroute is Pampur, 9 miles south east of Srinagar. Subsequent halts are at Avantipur, Brijbihara and Martand. Martand is known for its ancient temple dedicated to the Sun God - now in ruins. Enroute to Martand are Anant Nag and Gautam Nag. Martand is known as the architectural lion of Kashmir. It is a temple with a colonnade of 84 columns full of artistic work. This temple dates back to Lalitaditya of Kashmir of the 8th century. The next halt is at Aishmukam, and the next is Pahalgam, which is reached on the day of Dasami, the tenth day of the bright half of the month. At Pahalgam is the confluence of the rivers Seshnag and Liddar. The next stop enroute is Chandanwadi, from where the confluence of the rivers Asthan Marg and Seshnag. Further up is the Pishu Ghati, believed to be the site where the demons were crushed by the Gods. Further up is the Seshnag lake at a height of about 12000 feet above sea level. The Seshnag river flows out of this lake. The next halt is at Wavjan before the steep climb to the Mahagunus Pass at a height of 14000 feet, after which there is a down slope leading to Panchatarni. From here, the Amarnath cave is reached on the full moon day, and the pilgrimage is complete.